Whether your gaze is terrestrial or celestial, Barska sport optical binoculars are designed to do more than just “zoom in”. These Focus Free Binoculars with a 9x magnification balanced with a 25mm lens, are designed to make instant viewing available when there's no time to be fumbling with a focus knob. A Porro design with BK-7 glass and multicoated optics create a viewing experience of clarity and high contrast while blue tinted lenses help reduce glare. 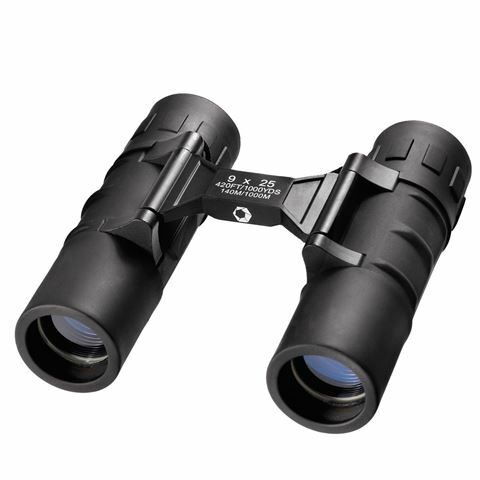 These Focus Free Binoculars are ideal for all around long-distance scope for sporting events and races, nature walks, wildlife observation or any situation where a fixed focus binocular could enhance the visual experience. Complete with a Carrying Case, Neck Strap, Lens Covers and Lens Cloth, it's also just the right size to fit in your backpack, Barska really has all of their bases covered! Blue tinted lenses help to reduce glare. BK7 porros prism provides clarity and high contrast. 9 x magnification makes instant viewing available without the need to focus, and paired with 25mm objective lenses provides stable viewing in accordance with your field of view. 100-meter field of view at 1000 meters. Includes a carrying case with neck strap, lens cover, lens cloth and instructions manual. Dimensions: 11cm (l) x 3.5cm (h) x 11.5cm (w).